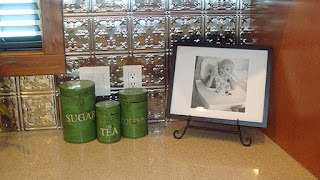 Serenity Now: DIY: Framing Fun from The Dollar Store! 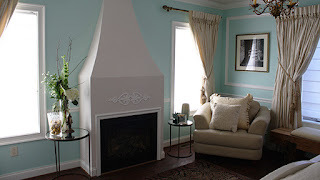 I'm editing and updating this oldie but goodie from the first weeks of Thrifty Thursday: It's Chic to be Cheap to link up to Kimba at A Soft Place to Land. It's Do It Yourself Day over at her site, and there are always loads of fabulous ideas to browse through over there. I don't watch Oprah very often anymore. I do, however, tune in whenever she does the home makeover shows. I love watching the designers transform a home to reflect the homeowners' personalities. It doesn't hurt that Nate Berkus. is. a. hottie. Seriously. If I can make it through an episode of Extreme Makeover: Home Edition without shedding a tear, I'm in good shape. That's another show that I like because the designers really seem to take the homeowners' tastes and style into consideration, unlike Hildi from Trading Spaces, which I haven't seen in years. Wasn't she the one who decorated a family room by gluing hay on the walls??! But it doesn't. At all. (photos from ABC.com) I have been too chicken to try things up until I was introduced to the wonderful world of blogging. I did some soul-searching once when I wasn't watching TiVo'd episodes of Grey's Anatomy or The Office, and I decided that one of the decorating elements that's important to me is displaying family photos, both current shots and "heirloom" portraits. This is where the thrifty part comes in. I promise I'll get there, ya'll. When T's grandparents came to visit, they brought a packet of old photos for me to go through. My plan was to do an entire wall of old black and white family photos in the "New Room"(we added it on last year, and I don't know what to call it!). I used our crappy old HP printer/copier/fax/scanner to scan the photos onto my laptop. Much cheaper than taking them to the camera store or copy shop for a scan. I stuck the photos on my zip drive, and printed them out at Target's Kodak machine...again, much less costly than Ritz Camera! But frames are expensive (my mom just had something priced for $350 at Michaels--at 50% off!!). Natalie took all my Scotch tape to play some weird make-believe game after being inspired by an episode of The Berenstain Bears, so I couldn't just tape them on the wall, now could I? Well, because I am a good listener, I headed over to The Dollar Store in the nearest shopping center. My friend, Kelly, swears by The Dollar Store. She has all sorts of beautiful, crafty creations that she's made with materials purchased at TDS. Much like WalMart, the idea of shopping at The Dollar Store used to make me break out in hives... until I actually went in and found some cute stuff! Not only did TDS have a bunch of 5x7 frames, but they also had many different sizes of mats, in a variety of colors! I purchased a stack of black 5x7 frames and white mats and hurried home to start on my project before Natalie came home from preschool and asked to "help." I ended up with some beautifully framed family photos! I knew I had some extra 5x7 frames stuffed in a craft bin somewhere. They were brown wood, but a can of $0.97 black spray paint from WalMart fixed those, and voila! Matching frames. Here's an example of the finished product! I finally got the gumption to hang them! I have several walls that feature my Dollar Tree frames, and the visitors at my sister's bridal shower had very positive comments. I'm planning on doing a reveal of the "New Room" (as we call it) soon. I am hoping that The Nester does another Price My Space party soon! What ways have you found to save in the home decor department? Have you ever snatched up a fabulous find at The Dollar Store? So far, I haven't found any frames/decor items that I have been crazy about at TDS, but I have found tons of great scrapbooking items!! I love to scrapbook (but it's often soo expensive) enter the dollar store! Yea! I can't believe I missed your decorating dilemma party. I have a few huge dilemmas and needed some input but just didn't get the pics taken....ugh. It was a huge success....yea for you! That is an adorable photo! The frame is perfect. Your frames are too cute!! They came out really nice! I love how your photo frame arrangement came out. Thanks for sharing. Hey Amanda! I just love your blog, I can't believe you got those frames at the dollar store! I may need to take you with me when I go scouting the 'Burg for items to decorate the home I'll be renting in December. Are you planning on making your decorating dilemmas party a monthly or weekly thing b/c I'm sure I'll have pleanty of dilemmas once I move that I could use some help with. Take care! I have a bag full of frames from our local thrift store at the ready for just such a project! I got several sizes, shapes, colors but they will ALL become black soon also with some lovely spray paint - now to choose the photos - size to match the frames available...yay! Great idea! I haven't bought any crafty items there, but in Nashville we have Dollar Tree and they sell some water goblets for $1 each that are the exact same ones Pottery Barn sells for $4. I used to work at PB and a co-worker shared that dirty little secret with me. So glad to hear my kids aren't the only ones who use up ALL my scotch tape. And I never even notice until I need to use it!! You did a fabulous job with those pics!!!! I often forget to shop at The Dollar Store...a good friend of mine is always finding awesome things there and then I wanna knock myself upside my head when I compare what I spent on the same things to what she spent!! Love them Amanda! AND I LOOOOOVE the Dollar Store! Best invention ever. For Real. Great display! I enjoy looking at people's pictures in their homes. Yours are just right. Amanda, I love DT frames! I have found some really nice ones in the past. Your picture wall looks great!